Non-Functional Testing is one of the types of software testing. The major role of it is to test the performance of the system as per its parameters. Here is the blog to provide you some of the non functional testing types in software testing. It also comes under the black box testing technique. Compatibility Testing helps to test the compatibility of a software application with various software and hardware systems. It is one of the types of non-functional testing. It must be performing to verify the developed software application is working correctly on multiple devices and platforms or not. Compliance Testing is also called as Conformance Testing or Standards Testing or Regular Testing. It is defined as to determine whether the product complies with basic requirements under certain specifications or standards. In other words, we can say that compliance testing is a process of verifying the compliance of a system and it met all the specified standards or not. Installation Testing helps to verify the software application is working correctly or not after installation. It helps to validate whether it is performing well or not if any updates or modifications have been done. It is also one of the types of non-functional testing. The process of validating the working performance of a software application according to the local settings or targeted location. While doing localization testing the aspects like content and UI may get affected. In a simple way we can say that if an application is designed for the USA, then the time, currency and language format should follow US standards. Performance Testing comes under non-functional testing types. It determines to test the performance of a software application under a certain workload. 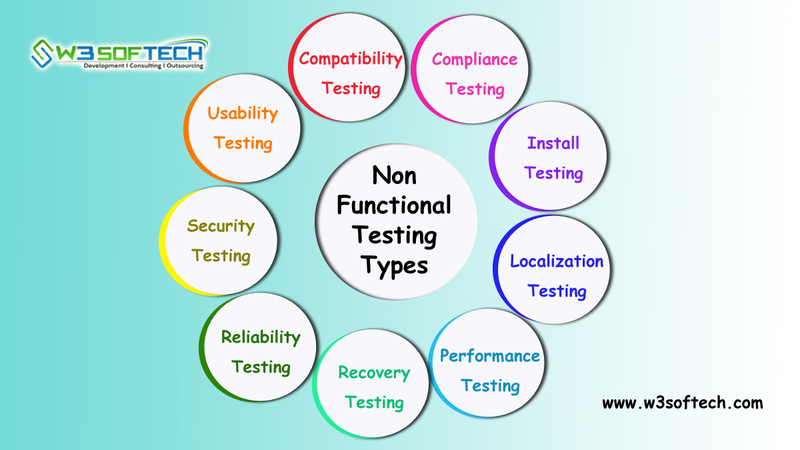 This is the most important testing type of non-functional testing which is divided into 6 types. Namely Load Testing, Stress Testing, Endurance Testing, Spike Testing, Volume Testing and Scalability Testing. Load Testing is one of the types of non-functional testing. It works on verification of the performance of a system under any load conditions. Load conditions are referred to a system facing pressure like many users accessing the system at a time. It helps to check whether the system is getting proper response time and throughput. Stress Testing can be defined as to determine the performance of the system under a heavy workload that is more than design expectations. The main of this testing is to point out the error of an application when load increases. It helps to calculate the time period of the workload of a system application under certain requirements. Endurance Testing comes under non-functional testing types. Endurance Testing is also known as Soak Testing. It determines the performance of the system under sudden increment or decrement of the load by users. It is also one of the types of non-functional testing. Volume Testing determines to verify the software application’s performance under a large number of database volumes. It also known as Flood Testing. It comes under non-functional testing types which mainly focuses on the database. Scalability Testing is one of the types of non-functional testing. The main purpose of it is to check the performance of the system. In terms of scalability like to scale up or scale down depending on the user requests. The process of testing to determine how quickly the system can recover data and face with any system failure or loss of data. It also comes under non-functional testing types. The main aim of recovery testing is to verify whether the system is working properly after a system crash. If the software product provides the same output results repeatedly under a specified period of time and the environment. In other words, we can say that if a product is defect-free and provides the same output results. Security Testing is one of the types of non-functional testing. It helps to test and find any threats or risks in a software application. Also to check whether is any loss of data. The major role of security testing is to identify the risks or threats of a system and help developers to fix these issues. Usability Testing or UX (User Experience) Testing which comes under non functional testing types. It plays a key role on focusing the user flexibility and ability to use the application. This testing can be clearly understood if it goes under real-time users.